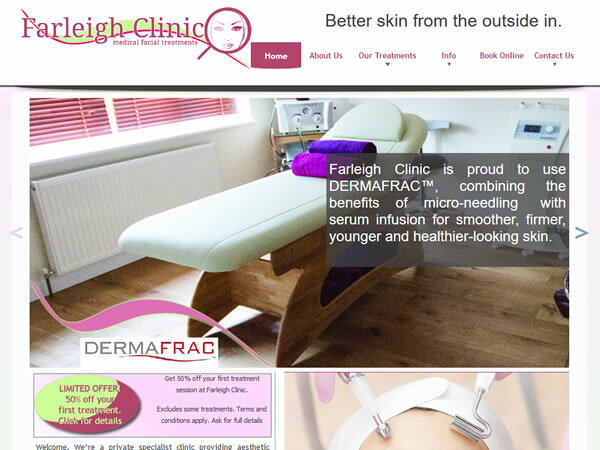 Farleigh Dental (farleighdental.co.uk) contracted us to create a site and branding for their new medical aesthetic facial treatments. As with Farleigh Dental, we again took care of all the requirements. This included the name and creating everything from logo to website and signage. We researched the products and treatments offered by the client’s new business. By directly contacting the treatment and equipment suppliers/manufacturers we were able to ensure accuracy of the new site's content. Ensuring clients both existing and new could find clear and concise information about the treatments available was essential. We also had to make sure that we covered all potential legalities, to protect not just the client but also ourselves. The highly-interactive site is designed to provide clear and accurate information about the client’s services, in addition to contact details for the business. We’ve recently been adding new content and features to the site, with more to come soon.